← Are We Saved By Faith Only? Yesterday was Veterans Day in the United States. But it is celebrated as a holiday today. Known in other countries as Armistice Day or Remembrance Day, it celebrates the conclusion of major hostilities of World War I on the 11th hour, of the 11th day of the 11th month of 1918. In honor of our military, all non-essential federal offices will be closed. No mail is delivered. And federal workers receive a paid holiday. Many towns have parades or other events honoring veterans. Some businesses offer discounts to those who served in the military. While we appreciate and honor those who have severed our country and some have paid the ultimate price to maintain our freedom, consider a different kind of soldier. 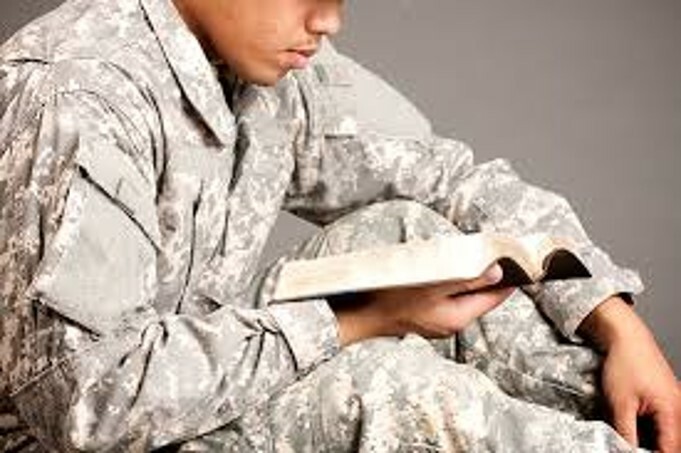 The Bible metaphorically uses the word “soldier” to refer to Christians. In writing to the young evangelist, Timothy, the apostle Paul exhorted, “You, therefore, must endure hardship as a good soldier of Jesus Christ. No one engaged in warfare entangles himself with the affairs of this life, that he may please him who enlisted him as a soldier” (2 Tim. 2:3-4). Paul also referred to Epaphroditus, as “my brother, fellow worker, and fellow soldier” (Phil. 2:25). Also, he greeted “Archippus as “our fellow soldier” (Phile 2). Furthermore the Bible often uses military metaphors to describe our fight against Satan and the enemies of Truth. To that end, Paul urged us to “fight the good fight of faith” (1 Tim. 6:12). Of course, “the weapons of our warfare are not carnal,” but spiritual (2 Cor. 10:4-5). While some folks dismiss the devil with jokes and silly remarks, the devil is no laughing matter. He is real. He is active. He is our enemy. And we are engaged in spiritual battle with him and his cohorts. We are reminded that “ we do not wrestle against flesh and blood, but against principalities, against powers, against the rulers of the darkness of this age, against spiritual hosts of wickedness in the heavenly places. Note what this spiritual armor entails. “Stand therefore, having girded your waist with truth, having put on the breastplate of righteousness, and having shod your feet with the preparation of the gospel of peace; above all, taking the shield of faith with which you will be able to quench all the fiery darts of the wicked one. And take the helmet of salvation, and the sword of the Spirit, which is the word of God;” (Eph 6:10-17). The real world, however, reminds us of the need to stay on guard, stand firm and fight against the temptations that daily attack us. We need our amour both defensively and offensively. We fight against immorality, and “fleshly lusts that war against the soul” (1 Pet 2:11). We fight against the external forces around us that call for a compromise of Truth and even surrender to Satan’s shrewd schemes. Like Israel of Old, he has convinced many today that evil is good and good is evil. That darkness is light and light is darkness. The sweetness of God’s Word is labeled as bitter. And the bitter taste of sin is now called sweet (Isa 5:20). We also must be aware of the Devil’sl assaults on our hearts. We fight against the sins of envy, jealousy, and bitterness. Selfishness, pride and overconfidence have destroyed the best of soldiers.